The main concert space at the new Aura could host as many as 100 concerts a year, its owners say. Aura co-owner Krista Newman said, “We think this will give us the chance to attract a whole new list of artists, which is exciting. Asylum nightclub, a fixture of downtown Portland’s entertainment scene for nearly 20 years, is changing its name to Aura as a part of a $9.1 million expansion and makeover that will double its capacity, its owners announced Friday. The owners say the expansion will allow the venue to host a wider range of events, including more national concerts, weddings and conferences. 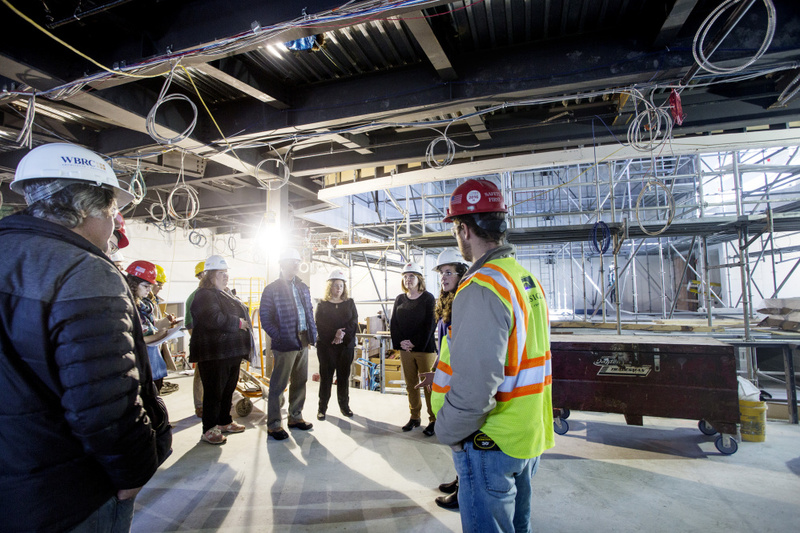 Aura is scheduled to open in April, and on Friday the owners hosted an invitation-only tour of the expansion in progress. The renovated main concert space will have a capacity of about 1,000 people, compared with roughly 500 before, and could host as many as 100 concerts a year. The venue had been known in recent years more for deejays and dancing, with national and local acts as part of the mix. The new capacity ranks Aura in the middle of Portland’s music venues, based on size, between clubs and large theaters. The largest indoor venue regularly used for concerts is Cross Insurance Arena, with a capacity of more than 6,000, depending on how seating is configured. The city has two large fixed-seat theater venues, the city-owned Merrill Auditorium with a capacity of about 1,900 people and the State Theatre with about 1,800. After Aura would come Port City Music Hall, with a capacity of 500 or more, then smaller clubs. Construction is progressing on Aura, previously Asylum, as seen from Free Street in Portland on Friday. The owners Friday released a list of more than 20 national acts already booked between April and September, including Dwight Yoakam, Todd Rundgren, Buddy Guy, Wynonna Judd, Bret Michaels, Everclear and Frankie Ballard. The first scheduled show is April 27, featuring Get the Led Out, a Led Zeppelin tribute band. The booking of music acts at Aura will be handled as a joint venture involving Live Nation, a national concert and event booking company, and Bangor-based Waterfront Concerts, which brings national acts each summer to Darling’s Waterfront Pavilion in Bangor and The Maine State Pier in Portland. The size of the new Aura, and the seating configuration, was decided upon with help from Live Nation and Waterfront Concerts, said Newman. Because Portland has not had a 1,000-capacity venue, something that falls between the clubs and the theaters, the city was missing out on some national acts touring in the region, said Bob Duteau, a Live Nation representative who was at Aura Friday. He also said the addition of room for about 700 seats, depending on the show, helps draw different acts. Rundgren, for instance, had his biggest hits in the 1970s and can fill a big venue, but his audience probably doesn’t want to stand all night. Duteau said he’s had acts play nearby, like at the Casino Ballroom in Hampton Beach, New Hampshire, but then forgo a stop in Portland because the right venue wasn’t available. The Portland club previously known as Asylum is undergoing a $9 million renovation and is expected to reopen in April as Aura. The new venue will have a 1,000-seat capacity and will be marketed for concerts, conferences and other events. Visitors get a tour of the main stage area Friday. The new layout of the main concert and event space includes a stage, a floor-level standing area directly in front, and a raised viewing area with room for seats beyond that. 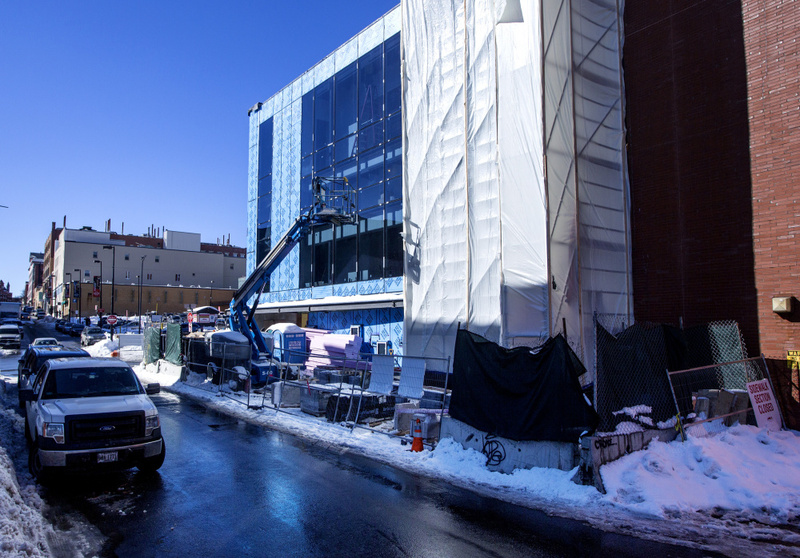 On one side of the venue is a massive, 30-foot wall of windows looking out onto Free Street. A balcony will ring about two-thirds of the space, with seating for 144 and standing room for about the same amount of people. Newman said developing a venue where everyone could see the stage was important to her and her partners. 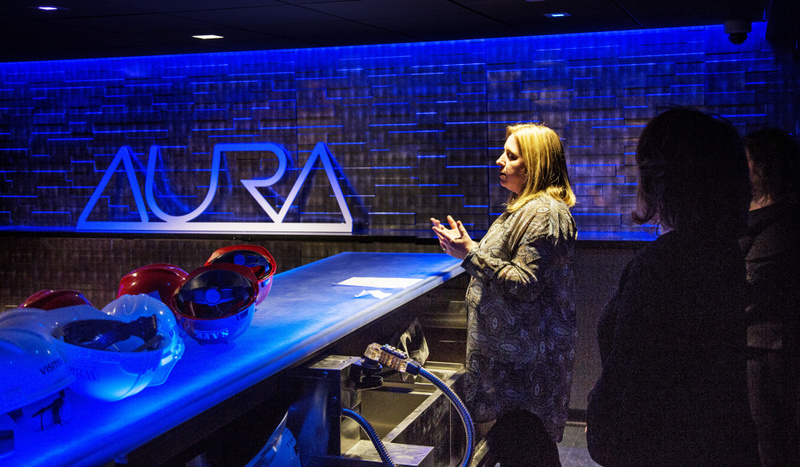 Besides concerts, the owners hope the new Aura will attract weddings, conferences and corporate events. 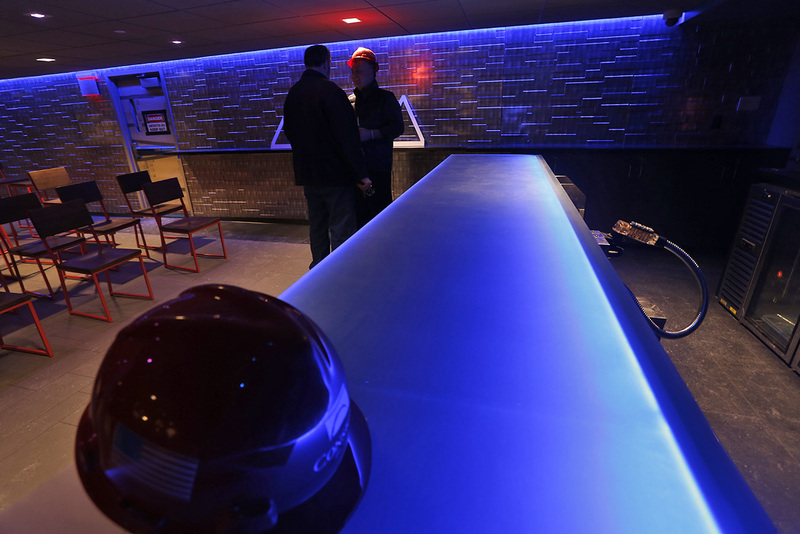 There is a VIP room for “meet and greet” events with the band, plus another bar area in the basement and the adjacent sports bar. When complete, the renovation will have increased the venue’s size from about 10,000 square feet to about 25,000. One definition of the word aura is “the distinctive atmosphere or quality that seems to surround and be generated by a person, thing, or place.” Newman said she and her partners picked the name because it had a “soothing” quality and they wanted a name that reflected the venue’s ability to host more than just concerts. People wait in the “pool room” to tour the new club Aura on Friday. Owners Newman, Laurie Willey and Valerie Levy opened Asylum, at 121 Center St., in 1997. They had no experience in the club business, yet have survived 20 years. Two other clubs opened the same month: Metropolis and Millennium. Both of those are long closed. Asylum/Aura was once known as Morganfield’s, a restaurant and concert venue focusing on blues and folk acts. Over the years, Asylum became known for its 1,500-square foot exterior graffiti wall, off Free Street. The owners gave local artists permission to create giant murals filling the wall. The wall was torn down in August as part of the expansion.